Never lose track of time with the Treehut Zebrawood Men's Watch! This analog timepiece combines rustic looks with high-tech components. A watch is a must-have accessory for modern men who are always on the go. And Treehut presents its elegant and eco-conscious products. Timepieces handcrafted by Treehut combine minimalist design with heavy-duty materials. This wooden watch is handcrafted from genuine Zebrawood with an unpainted polished wood grain finish. The diameter of the dial is 1.7 inches and surrounded by natural black notches representing the hours and minutes. In addition, it features sturdy stainless steel tri-fold clasp with push buttons. It has a one-size-fits-all band that can be adjusted from seven to nine inches to suit various wrist sizes. This product is lightweight and durable. The wristwatch features 3 ATM water resistant. It and can withstand splashes of water or rain. The advantage of wooden watches over metal clocks is that the former do not wear down. In fact, wooden watches become even more stunning with age. Thus, making them a good choice when you really want a long-lasting accessory. Treehut equips their premium watches with Japanese Miyota Quartz Movement. The Miyota Quartz Movement ensures no extra time is gained even after a year of usage of the Zebrawood. This wooden watch also comes with a padded box, ready to be gifted to your male friends or partner. Enjoy a 2-year manufacturer's warranty with every purchase of Treehut Zebrawood Watch! MINIMALIST DESIGN FOR THE MODERN MAN - A wristwatch is a must-have accessory for men, and what better way to stand out from the crowd is to wear a unique fashion statement. Treehut Zebrawood is a beautiful wood grain timepiece that spells smart and simple. The dial has a diameter of 1.7 inches and is surrounded by natural black hands and hour markers. Its adjustable strap is made from wood too, while its clasp is made from a stainless steel tri-fold. 100% REAL WOOD - Treehut sources its watches from sustainable wooden materials, and this wristwatch is made from genuine Zebrawood. No harmful chemicals or paints were used. What you get is an all-natural cream color with dark brown streaks resembling a zebra's stripes. MIYOTA QUARTZ MOVEMENT - The Japanese Miyota Quartz Movement is renowned for its precise and accurate time. Not a second lags behind even if you continuously use the watch for 5 years. In addition, it complies with the RoHS Directive and features mercury-free batteries. 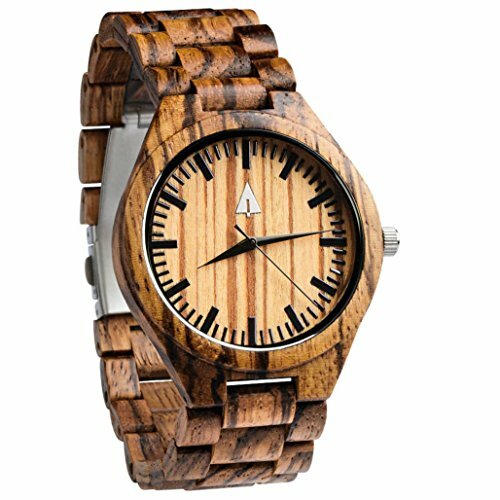 HIGH QUALITY WATCH - If you're looking for long-lasting wristwatch then the Treehut Zebrawood is your go-to watch. With its 3 ATM water resistance, it can withstand splashes of water or rain. It is highly suitable for everyday wear. 2-YEAR WARRANTY AND GIFT BOX - Every purchase of this analog Zebrawood timepiece comes with a 2-year manufacturer's warranty and a padded gift box.